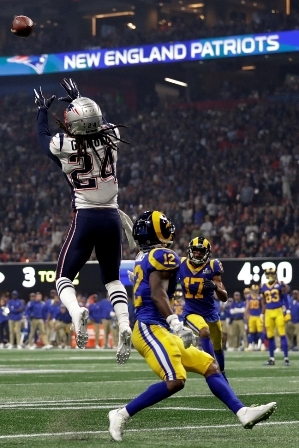 The cliché “defense wins championships” was played out on America’s largest domestic sports stage in Super Bowl LIII on Sunday at the Mercedes Benz Stadium as the New England Patriots defeated the Los Angeles Rams, 13-3. The heavily relied on defenses of both teams made for an underwhelming Super Bowl fan experience as television ratings hit a 10-year low of 44.9/68 share, according to the Sports Business Journal. “This was for it all, the last two teams, we fell short,” stated back-to-back NFL defensive player of the year, Rams’ defensive tackle, Aaron Donald stated. Coincidentally, the New England Patriots’ dynasty began with a 2002 Super Bowl victory over the St. Louis Rams exactly 17 years ago Sunday. That game was the first of six Super Bowl championships the New England Patriots’ coach/quarterback duo Tom Brady and Bill Belichick would go on to win. 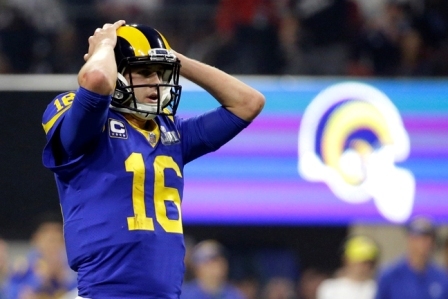 This, Super Bowl LIII, was projected to end in favor of the new-era L.A. Rams, the team that was the last standing undefeated franchise in the NFL’s regular season. The team that started out on an eight-game winning streak led by the youngest coach in Super Bowl history, 33-year-old Sean McVay and anchored by Jared Goff, who would have been the second youngest quarterback to when a Super Bowl at 24-years-old. 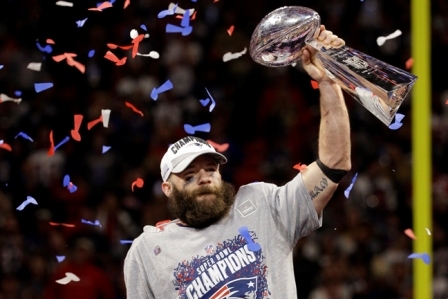 Instead, in the Patriots’ third consecutive Super Bowl appearance, the game came down to father time. On Sunday, the 41-year-old Brady became the oldest quarterback to ever win a Super Bowl along with 66-year-old Belichick, who is the oldest coach to win. "I think the value of experience is something, this is a humbling game,” reflected McVay on Brady’s nine Super Bowl appearances. While it was an accomplishment for McVay to be the youngest coach to appear in a Super Bowl in just his second year as the Rams’ head coach, the man who earned a reputation for his offensive genius and play-calling did not show up on Sunday. Before a crowd of 70,081 people at the Mercedes-Benz stadium, the Rams won the toss and elected to defer to the second half. 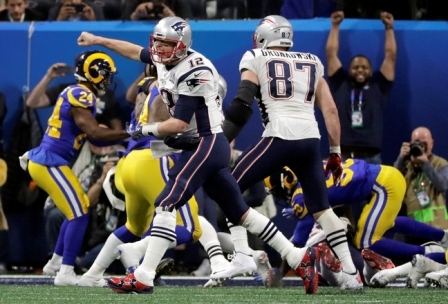 On the Patriots’ first drive, Rams’ inside linebacker, Cory Littleton picked off Tom Brady on his first pass attempt after the ball was tipped by former USC Trojan, Nickell Robey-Coleman. Los Angeles failed to capitalize on the opportunity to score first, going three-and-out on the earned extra drive. Through the first half, the Rams were unable to convert even one third down and finished with just two first downs. Los Angeles’ offense totaled 57 total yards in the first half. Meanwhile the Rams’ defense kept the Patriots off the board in the first quarter. Stephen Gostkowski missed a 46-yard field goal attempt. With 1:51 left in the first quarter, the Rams’ defense were able to sack Brady, the first time he had been sacked all postseason. Early in the second quarter, the Patriots earned the first points of the game on a 42-yard field goal by Gostkowski. The Rams tallied four additional possessions that the team was unable to convert any into points before the half concluded with a 3-0 Patriots advantage. To start the second half, Los Angeles sustained their longest run of the game to that point, a 16-yard run by Gurley. The following play, Gurley gained five yards, but it forced an incompletion and led to another Rams punt. Cornerback Marcus Peters gave the Rams offense some life as he forced back-to-back Patriot punts with pass breakups on two consecutive third downs. The Rams first touchdown attempt came with 3:42 left in the third quarter, Goff targeted Brandin Cooks in the end zone with a deep pass that was broken up by Devin McCourty. The Rams settled for a field goal to tie the game up after Greg Zuerlein nailed a 53-yarder. The third quarter ended knotted up at three. It was a 29-yard pass from Brady to tight end, Rob Gronkowski that set up the Patriots for a first and goal touchdown situation. Patriots’ running back, Sony Michel ran in the first and only touchdown of the game; his twelfth touchdown of the season. Patriots took a 10-3 lead with 7 minutes left in the final quarter. The Rams still had an opportunity to tie up the game on the following drive. Goff, under pressured, attempted a deep pass down the right sideline to Cooks that was instead intercepted by cornerback Stephon Gilmore. With 1:16 left, New England charged down the field and kicked a 41-yard field goal to put the game out of reach. McVay went away from the exact game-planning that got his team to the Super Bowl. He abandoned the run, limited his star back Todd Gurley’s touches, made practically no offensive adjustments, and looked for the defense to bail out the dismal offense. Certainly, that is going to be something I'm sure I'll say, 'I wish I could have got him more involved.' We could have thrown him the ball. Despite being the lowest-scoring game in Super Bowl history, the game was marked by many historical firsts. Brady became the first player in NFL history to win six Super Bowl rings and the oldest quarterback to both start and win on the biggest stage. On the other side, Rams’ punter, Johnny Hekker made Super Bowl history as he booted a 65-yard. The Rams were shutout for the first time in a half since McVay took over as head coach and it was the first time a team did not score a touchdown in a Super Bowl. The blame cannot be solely placed on McVay, as 24-year-old Goff was visibly intimidated by the magnitude of the moment. "It wasn't a game we needed 30 points to win. We needed two touchdowns, and I couldn't get it done. That's on me. I'm the guy who has to drive this offense." Uncharacteristically, Goff held on to the ball for entirely too long in the pocket, missed reads, and elected to take sacks instead of finding an open target. Goff finished 19-of-38 for 229 yards with no touchdowns and threw a fourth-quarter interception into the hands of Stephon Gilmore that sealed any chances the Rams had to come back. "Obviously, I should have thrown it away," Goff said. "I knew it was 'zero'—of course I did—but I thought I could make a play. I didn't realize [Stephon] Gilmore was staring at me, and I threw too early. I put it in a bad spot. It was dumb. It was stupid. I will learn from it. But it really hurts right now." Meanwhile, the Rams’ offensive line gave up four sacks. Goff was pressured all game by the Patriots’ defense. In what was Los Angeles’ best all-around defensive showing, the offense could not hold up their end of the bargain. The Rams were sent off to their first Super Bowl appearance since moving back to Los Angeles in 2016 by thousands of fans, who attended a send-off rally at the team's under-construction Inglewood stadium site one week before the team took on the Patriots. The Rams have a new $2.6 billion stadium to look forward to moving into, set to open in 2020. Though the team was unable to bring back the Vince Lombardi trophy to Los Angeles this year, there is much optimism that the team boasting a young quarterback/coach tandem, a dynamic running back in Todd Gurley and one of the most highly-decorated defenses in the NFL.